The game was Zone Zeal. The team searched and searched for a place to work but came up with nothing so Mr. Swartley’s classroom became our workspace. The chassis design we chose included waterjet cut plywood panels. The company that donated this to us had a backlog of paying work and we waited quite a while for the parts. We ended up with little time to build the robot and get things working well. We used the school cafeteria to practice driving the robot. It wasn’t ideal, but the team made the best of it. The team participated in the inaugural St. Louis Regional with an overall record of 5-3-0. Zone Zeal was the 2002 FRC game. 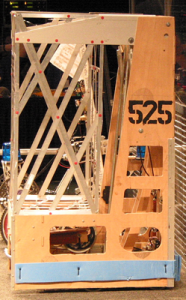 The two alliances of 2 robots compete to move goals and balls into various zones within the playing field. There were 40 balls arranged along the sides of the field in the center zone and the two adjacent zones. In the center zone were three mobile goals. The strategy was to pick up the balls, place them in a goal and move it to a scoring zone, while preventing the opposing alliance from doing the same.